In this tutorial I will give an example of how to assemble a board of effects pedals for use with guitar, keyboard, or any other instrument with a pickup or ¼” output. I will cover the basics for what is needed, and go over a common ideal placement for different types of effects. There are many different types of effects which have been put into pedal form for use with guitars and other instruments. They can be used to change the timbre, add space, alter pitch, modulate volume, add echoes, and more. For the purpose of this tutorial, I will break them down into four general categories: drive, pitch shift, modulation, and delay/reverb. Keep in mind that there are many other types of pedals as well, but this selection will give us enough to work with and get a functional board together. – an actual board of some sort. These can be made by hand with a little bit of hard work and some wood, or, if you have the money, there are a few different options ready to use. In this example I will be using a Pedaltrain-2 by Pedaltrain. – either velcro or zip ties in order to fasten your pedals to your board. 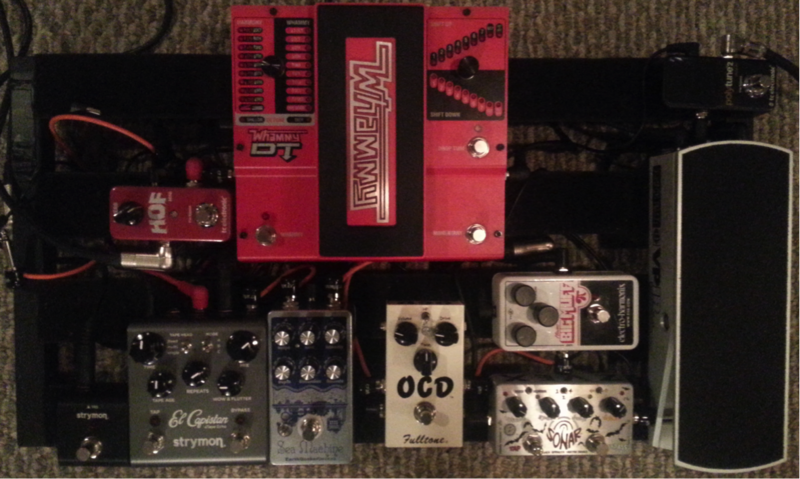 I will be using velcro, as that is what comes with the Pedaltrain-2. – ¼” patch cables to connect your pedals. These can be bought in a variety of lengths, or custom kits can be bought so you can make them the exact length you need, such as with the George L’s cables that I will be using. – a sufficient power supply. There are many options for power supplies these days, and it has become quite common for people to “daisy chain” pedals together with a single 9V supply; however, I would suggest instead that you invest in a clean power supply with multiple isolated outputs for the best results (minimal noise). I will be using a Voodoo Lab Pedal Power 2 Plus. – last, but not least, you will need the pedals of your choosing. Once you have all of your materials, it is time to start assembling your pedal board. Step 1: lay out your pedals on the board in the order that you want and make sure that everything fits the way you want it to before you begin to make any other connections. It is best to arrange them from right to left, as this is how most pedals are configured with the inputs on the right side and the outputs on the left side. Once they are where you want them, you can secure them down with velcro/zip ties. Step 2: connect the pedals using the patch cables. Make sure that you connect from the output of one pedal to the input of the next. Use a longer cable to connect the output from the last pedal to the input of your amplifier. Step 3: connect the power cables from your power supply to your pedals. Step 4: with the output of the last pedal in the chain connected to the input of the amp, and with your guitar connected to the input of the first pedal in the chain, turn on your amplifier and start playing and experimenting with the sounds now at your disposal. When it comes to deciding the placement and order of your pedals, it is important to remember that there is no one correct way to do it. Use your ears and experiment with the placement until you are able to achieve the sounds that you desire; these are tools to experiment and have fun with, so try out different things. With that being said, here are some tips for those seeking a conventional pedal order as a starting point. I will use part of my current setup as an example. Guitar > tuner > volume > pitch shift > tremolo > fuzz > overdrive > chorus > delay > reverb > amp. Tuners are good to have at the beginning of the chain as they will receive the signal directly from your guitar without any interference in between, ensuring that it will be at its most accurate. The volume pedal comes next, acting the same way as the volume pot on a guitar would. Having it before the overdrive makes for more natural swelling sounds, however, you could also place it at the end for a more “choppy” effect. Pitch shifting pedals are also good to have near the beginning of the chain as the tracking will be more accurate than if it were at the end; I also found that, in my situation, it was better to have the overdrive pedal driving the shifted sound rather than have the pitch pedal shift the sound of an already driven signal. Experimentation is key, though. Next I have my tremolo pedal, which could really go just about anywhere, but I placed it here because the manual said it worked best right before overdrive/distortion/fuzz pedals. Naturally, then, the next pedals are fuzz and overdrive. After this come the modulation pedals; I only have a chorus, but you could also place something like a flanger or phaser here. Time based effects like delay usually come next, near the end of the chain. This is so that the delay will repeat the sound with any effects that are placed on it before, if that is what you want. Last in the chain is typically a reverb, putting all of the sounds in the same space that you have created. 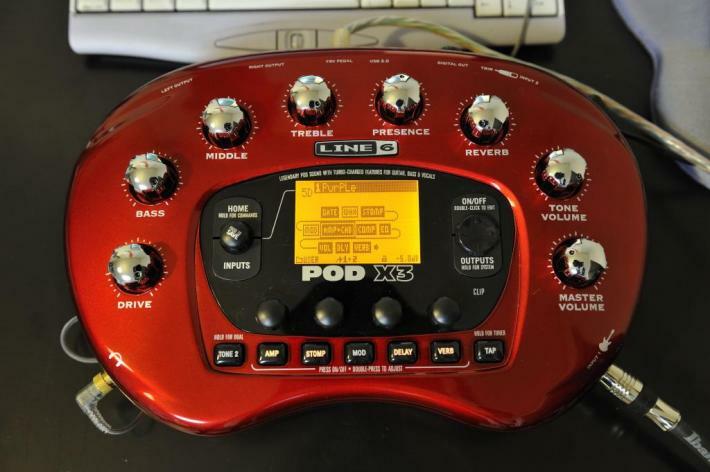 The POD X3 from Line 6 is a very versatile tool for creating electric guitar sounds without the use of an amplifier or effects units. It provides a plethora of options for amp and cabinet models as well as a huge library of stomp effects, modulation effects, delays and reverbs. The POD also provides a two-tone system to combine amp models or swap freely between the two. It is also functional as an audio interface via USB, allowing for quickly and easily recording guitar tracks without the need for a microphone (though it does have a standard XLR input as well). This tutorial will provide a rudimentary explanation of how to quickly and easily create a tone using the POD X3. 1. Turn the POD on via the switch on the right side next to the AC adapter plug. 2. Plug a guitar into Input 1 (Input 2 being the XLR input) on the front right side of the POD, and headphones or speakers into the 1/4” headphone jack on the left side. a. It should be noted that the POD X3 can output via the Left and Right Output jacks at the rear of the device as well, which can be accessed by the OUTPUTS button on the right side of the main control panel. However, for simplicity, this guide will assume the user is using the headphone jack. 3. Using the dial to the left of the screen with “PRESS TO SAVE” written over it (between the HOME and INPUTS buttons), scroll to an empty “User” patch (from bank 18 to 32). Alternatively, you can overwrite a preset for easier access. 4. Press the PRESS TO SAVE dial to save a new patch, and use the third and fourth dials under the POD X3 logo to make a new name for the patch. 5. Press the AMP button on the bottom of the control panel twice quickly to select an amp model. Use the PRESS TO SAVE dial to cycle through amp models. a. The first of the dials under the POD X3 logo selects whether to choose from guitar, bass, or preamp models (when using the microphone). 6. Each amp model uses a default cabinet model and microphone emulation. Press down on the cursor pad to the right of the screen, and then use the first and fourth dials under the POD X3 logo to cycle through cabinet models of varying sizes and microphone types. a. When using the POD as an audio interface, you can also select “NO CABINET” and run the amp sim through a cab impulse for a more realistic sound. The POD can also be run through an actual physical cabinet to bypass the cab sim entirely for live use. 7. After selecting amp and cabinet models, use the main amp dials surrounding the control panel to adjust settings as you would with a typical amplifier to your taste. b. Selecting specific objects in the signal chain on the home screen using the cursor pad, and double-tapping the ON/OFF button above the cursor pad to edit the selected object. This method allows for editing of some effects that aren’t available via physical buttons, such as the noise gate and compressor, or that aren’t useable without an FBV Pedal, such as wah and volume control. 9. Once effects have been adjusted to taste, press the PRESS TO SAVE dial again to save the patch.